Amongst those who will not feature in the first two rounds of continental competition are Bafana Bafana internationals Wayne Sandilands, Thabo Matlaba and Diamond Thopola. Also left out is last season’s top scorer and assist provider, Luvuyo Memela, who has struggled with injuries over the last six months. He was pictured getting off the Pirates team bus at Loftus Stadium on Saturday prior to facing Mamelodi Sundowns, suggesting he is close to a return. The winger has played just 26 minutes this campaign, coming on as a substitute against Cape Town City, before picking up another injury. The other players left out are Thabiso Kutumela – who started Pirates’ game against Sundowns – as well as Gladwin Shitolo, Justice Chabalala, Phetso Maphanga, Augustine Mahlonoko and Lyle Foster, who is expected to complete a transfer to AS Monaco in January. Wayne Sandilands: Has not recovered from his early-season howler against Highlands Park, and this would confirm him as the club’s fourth choice goalkeeper. Diamond Thopola & Thabo Matlaba: Both players have featured this season, but not particularly impressed. Pirates have used five different right backs, and have selected Mthokozisi Dube, Abbubakar Mobara and Asavela Mbekile as options on that flank. The latter’s return to favour has come at just the right time, as his vast experience will be crucial. He was Sundowns’ first choice right back when they won this tournament and is just the warrior needed for tough away games. Phetso Maphanga: The former Chippa left-back is now clearly below both Innocent Maela and Paseka Mako on that flank. Gladwin Shitolo: When fit, the central defender has been a regular starter since Milutin Sredojevic’s arrival, so this omission has only be down to injury. Thabiso Kutumela: This is a surprising call, as he started the side’s last game and when fully fit, has featured regularly over the last 18 months. This looks to be a call to allow the registration of Thamsanqa Gabuza, whose bustling style is perfect for poorer playing surfaces where playing out from the back will be more challenging. Justice Chabalala: Completely out of favour and a long way down the centre back pecking order. Augustine Mahlonoko & Lyle Foster: Both teenagers, with only a few minutes of first team experience, so it’s no surprise to see them left out. Foster is said to be close to joining AS Monaco after impressing on a three-month trial between August and October. 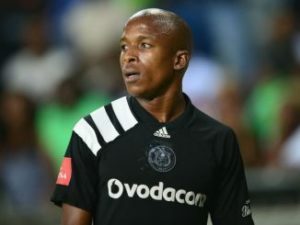 Luvuyo Memela: According to Mark Gleeson, Memela was seen getting off the Pirates bus at Loftus Stadium in Saturday and should therefore be close to an injury return. He was out injured for five months before his lone appearance this season at Cape Town City. He top-scored with five goals last season, as well as providing a team-high 11 assists. He led the team for shots and crosses last season, and is probably best suited to focusing on domestic action for now, and getting over his injury nightmare.